Real estate search giant Zillow has become the owner of hundreds of homes in the last year through its Zillow Offers service, in which the company buys properties directly from consumers for all-cash in select cities through its namesake website, and re-sells them on the open market. Now the company confirms that it is running tests on Zillow.com and its mobile apps that will show its own for-sale homes at the top of its home search pages, ahead of other competing for-sale listings. Screenshot of a Zillow search by an Inman editor. In fact, 22 of the 26 homes listed on the first page of an Inman reporter’s search results of for-sale and potential listings on a desktop, were homes owned by Zillow. 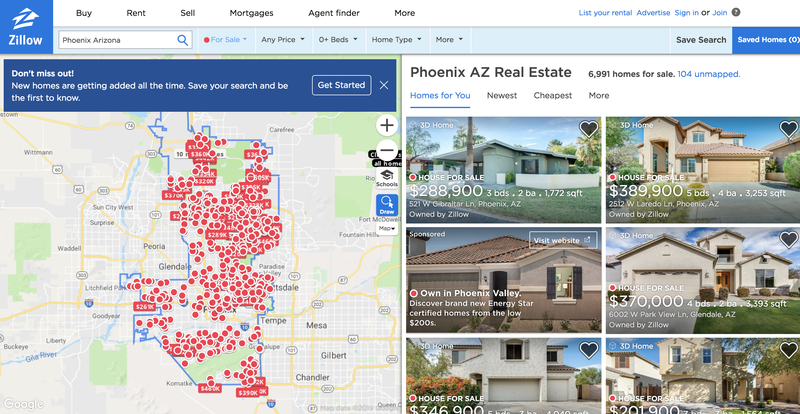 In Las Vegas, Zillow Offers’ second market, it took until the second page of searching for a non-Zillow-owned home to show up, searching only for-sale and potential listings under $600,000. “Additionally, as we experiment to improve the overall search experience on Zillow, we do test different ways we display search results, and that does include prominently displaying Zillow Owned homes, but we also prominently display listings that have video tours and 3D walkthroughs,” the spokesperson added. Agents whose listings appear on Zillow through agreements with local multiple listing services or direct feeds from their brokerage could feel slighted by Zillow Offers boosting its own listings above those of other companies. However, it should be noted, that as users change their filters or narrow their search on Zillow’s website and mobile app, it will further instantly change which listings rise to the top. The above video shows a screen recording of that Las Vegas search on a desktop. 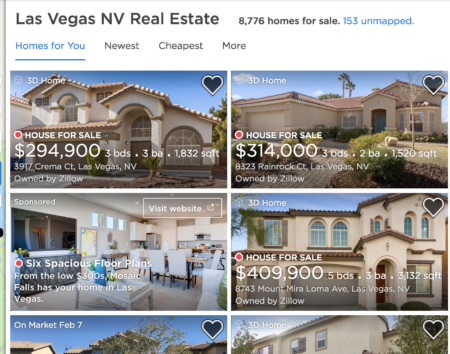 In a search of all homes for sale in Las Vegas on the mobile app, the first 34 results were all homes owned by Zillow, outside of one promoted listing. A Zillow spokesperson also told Inman that other real estate businesses and platforms boost their own listings. On Redfin, when searching in Seattle with no filters, the first two pages of results are Redfin listings. However Redfin, unlike Zillow, is a real estate brokerage that employs its own agents and is directly competing with other brokerages and franchises such as RE/MAX, Keller Williams, Century 21, etc. Zillow does not operate as a traditional brokerage in that it does not employ agents (though it has brokerage licenses in several states) and uses outside real estate agents at other brokerages to represent its Zillow-owned homes for-sale. Phoenix and Las Vegas are the two markets in which Zillow Offers has operated the longest, but even in Denver, the first two listings are homes owned by Zillow, when this reporter searched for-sale and potential listings. One commenter wrote in an Inman Facebook group thread about this phenomena that the first listing he saw in Phoenix was from rival online homebuyer and seller Opendoor. Multiple Inman staffers got different results when searching in Phoenix and Las Vegas. On homes that aren’t owned by Zillow, browsers are greeted by the message, “Buying but need to sell first? Get a Zillow Offer for your home,” under the listing photos. Page one of a search for homes in Las Vegas. Every home on the page is owned by Zillow. Zillow Offers is live in Phoenix, Las Vegas, Denver, Atlanta, Charlotte and Raleigh. It’s not clear if, in the latter three markets, whether Zillow has not prioritized their own listings or if, instead, the company doesn’t own enough homes for sale in those markets yet to display them. Zillow’s direct-to-consumer homebuying and selling platform – known in the industry as an “iBuyer” – plans to additionally launch in Houston, Dallas, Miami, Minneapolis, Nashville, Orlando, Portland and Riverside, California, in 2019. So far, however, investors on Wall Street have not been happy with Zillow’s foray into this new business, with the stock falling after Zillow’s iBuyer announcement in April 2018 and Zillow’s acquisition of a mortgage lender meant to aid in the effort. Zillow will announce its fourth quarter earnings on February 21, at which time the public will likely gain more insight into the first-year success of Zillow Offers. At the Inman Connect real estate conference in New York City this week, the CEO of Knock, another competitor to Zillow Offers, predicted that in 10 years, more than 50 percent of home sales will go towards iBuyers.